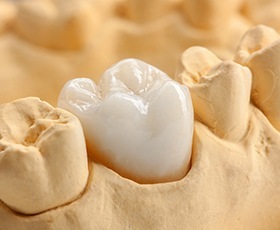 Dental Crowns & Bridges in Washington, D.C. Dental restorations are capable of rebuilding damaged teeth, correcting severe cosmetic flaws, repairing large areas of decay, replacing missing teeth, and other smile-related goals that can help our patients regain their oral health and function! At Davidson Dental Associates, our team offers several high-quality materials for crowns and bridges and will create precise, unique designs that are a perfect fit for your one-of-a-kind mouth. To schedule a consultation, please contact us today here in Washington, D.C. Your new crown will be crafted over multiple appointments. During the first visit, Dr. Davidson will adjust the tooth, capture detailed impressions, and send off her design to our trusted dental laboratory. 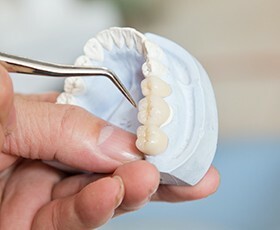 Then, eight to ten days later, you’ll return so that we can cement the new, permanent crown in place and make any final adjustments to ensure its success. Dental bridges are a possible reconstructive option when a patient has lost one tooth or multiple teeth that appear in a row. This type of restoration literally “bridges” the gap in your smile by anchoring over natural teeth on either side, resulting in a lifelike and sturdy result. Our practice also offers implant-retained bridges, which preserve more of your natural smile and are likely to be longer-lasting. Like dental crowns, bridges will typically require two appointments of your time to fully complete here in Washington, D.C.